The MaxT (maximum milking time) milking strategy can increase the number of cows milked an hour in many dairies without changing the dairy, affecting udder health or milk production and quality. MaxT is a strategy where cows are milked to a pre-determined end point, either a fixed time point or set milk flow rate threshold (if using automatic cluster removers). The idea is to estimate when about 80% of cows have completed milking and to simply remove the clusters from the remaining 20% even if unfinished. MaxT can be used in any type of milking system but will not suit all situations. Because it reduces row times, it depends on the operators being able to speed up their work routine. If the time it takes you to complete your routine is shorter than the milking time of the slowest cow, you will have some idle time. This often happens in sheds with a low cluster to operator ratio or around peak lactation. Using MaxT to minimise idle time will then help milk the herd in a shorter time. Numbers below are for a 40 a side herringbone milking 770 cows. How do I apply MaxT? MaxT is easy to apply in a herringbone. Perform your normal routine but don’t wait for the last 20% of cows to finish milking. e.g. 8 cows in a 40 aside shed. 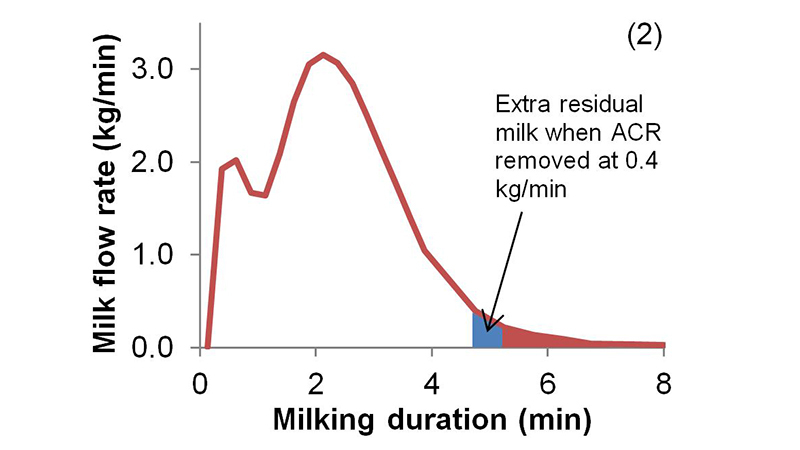 Some models of automatic cluster removers can be set to a maximum milking time, on others you need to increase the low flow threshold from 0.2 to 0.4 kg/min. If you are unsure how to change the threshold, contact the manufacturer. An efficient work routine, cupping technique and shed design help to give you the full benefit of MaxT. Make sure herd cell count is below 200,000 cells/mL because if it is above 200 000, it is a higher priority to improve cell count than focus on efficiency. Identify any elite cows (yield of more than 30% above herd average). You may want to cup them early in a herringbone so they get more time to milk out. If there are cows with odd shaped udders that have trouble milking out (usually older cows) you may want to treat them separately and not under-milk them. Use the milking efficiency calculator. By entering some basic farm details you can estimate the amount of time that can be saved for your situation. Differences in milk yields between morning and afternoon milking, mean that on average, cows take longer to milk out in the morning. If the work routine and number of clusters are balanced for AM then you will likely be overmilking at PM. If the work routine and number of clusters are balanced for PM then there will be idle time at AM. The solution is to apply MaxT in the morning, and apply a lesser level of MaxT in the afternoon. An example is provided below using a 770 cow herd in a 40-aside herringbone. Now the row times will be similar in both the morning and afternoon. With the milking time of slowest cows now matched, one ends up with a total milking time of 4 hr 50 min compared to ~ 6 hr 30 min without MaxT. Leaving residual milk in the udder goes against a long held industry belief that it will cause lost production and mastitis. Milk is held in two compartments of the udder; the cistern (a bag above the teat) which holds roughly 20% and the alveoli (the cells where the milk is made) which holds the other 80%. 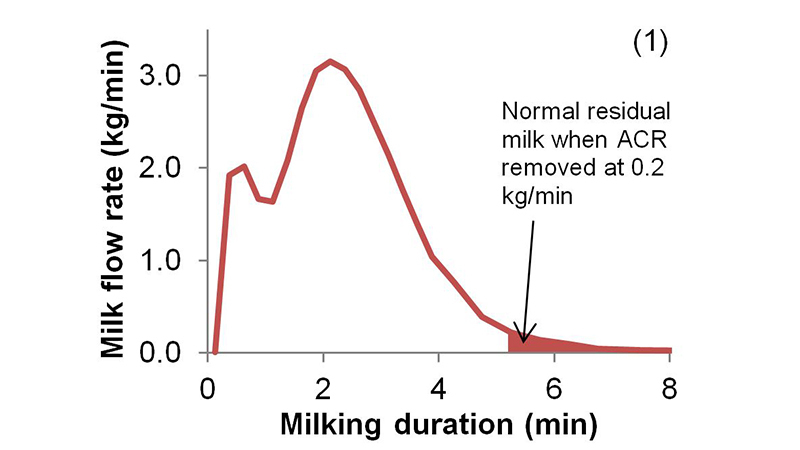 When clusters are attached, the milk harvested in the first few minutes is from the cistern, then the milk ejection or let down reflex is triggered. This causes the remaining milk to move from the alveoli into the cistern where it can be harvested by the machine. 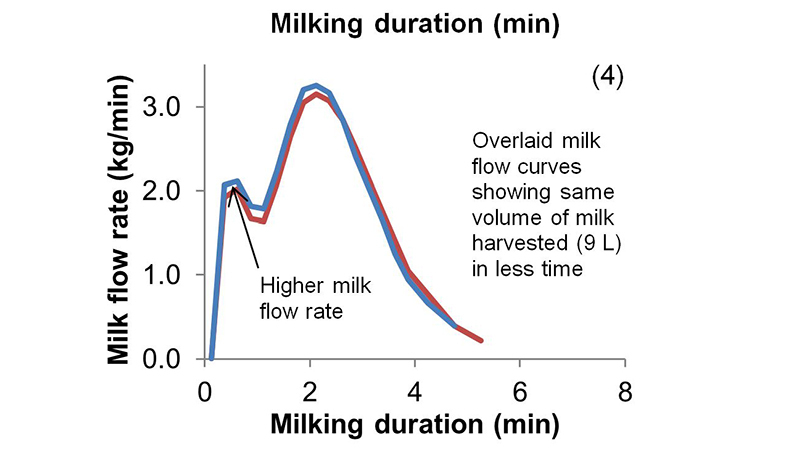 Detailed milk flow curves of normal cows show a greater milk flow rate during the first few minutes of milking, compared with cows whose clusters are removed early (MaxT). In other words, there is more milk being held in the cistern because it was left over from the previous milking. This milk is harvested immediately at the next milking without waiting for milk let down, so the milking duration is shorter and there is no net loss in milk production or increase in cell count. Basically, the residual milk is retained to the next milking where it can be harvested faster. 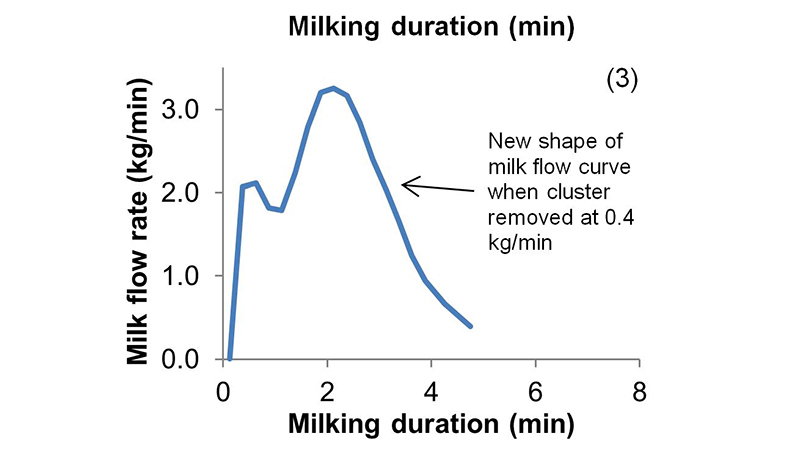 Effect on milk flow curve of removing clusters early. Click on the gallery of images to see detailed milk curves showing the effect of removing clusters earlier. To see a video demonstrating the concept of applying MaxT in comparison to standard milking procedure, view the animation at the bottom of this page. Gordon David prides himself on keeping his somatic cell counts low and has certificates from Fonterra attesting to his grade free status. Any concerns he had about this changing with the introduction of MaxT turned out to be unfounded and he says life is a hell of a lot easier since its adoption. The animated video below demonstrates the concept of applying MaxT in comparison to standard milking procedure. This animated video explains the most efficient routine for milking cows in a herringbone dairy with two people. Handy download giving you the basic steps for calculating MaxT for all dairy types. Improving the efficiency of milking in herringbone dairies.